Android devices are already used by over billion people across the globe, however, majority of them use it as their personal device, primarily because Android is more of a personal smartphone OS rather than being work related. However, it seems that Google now also wants to push Android to Businesses and have launched aptly named “Android For Work” initiative that will let Android users keep work-related accounts and app info completely separate from personal affairs while maintaining the security. Most of the users currently worry about using their devices for work – they accidentally do not want to share confidential info neither do they want the personal photos on phone to be exposed to their bosses at work. With “Android For Work”, an Android user can stay worry free and have separate profiles for work and personal use. According to the official announcement made today on Google India blog, they are launching this new initiative with group of partners that will help businesses bring more devices to work by securing, managing and innovating on the Android platform. Work profiles – users who have Android 5.0 Lollipop can create a dedicated work profile that isolates and protects work data. IT can deploy approved work apps right alongside their users’ personal apps knowing their sensitive data remains secured. People can use their personal apps knowing their employer only manages work data and won’t erase or view their personal content. Android for Work app – For devices running Ice Cream Sandwich through Kitkat, or that don’t run work profiles natively, Google has created the Android for Work app. The app, which delivers secure mail, calendar, contacts, documents, browsing and access to approved work apps, can be completely managed by IT administrators at work. 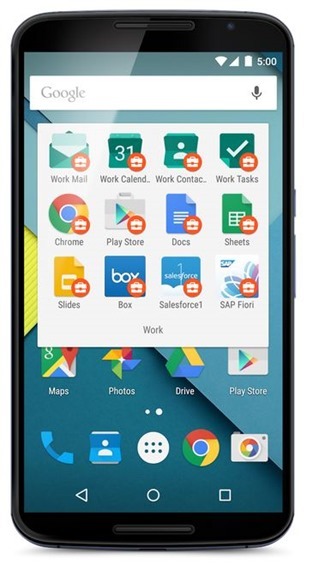 Built-in productivity tools – For everyday business tasks, Android for work includes suite of business apps for email, contacts and calendar, which supports both Exchange and Notes and provides document editing capabilities for documents, spreadsheets and presentations. For this initiative, Google has partnered with companies like SAP, Citrix, Blackberry, Adobe, Box, Concur, Cisco and many others to bring enterprise mobility management to Android. This includes standardized management APIs that will allow admins at work to manage all Android devices from one single dashboard. Software vendors and developers can create a single version of any Google Play app that can be securely deployed to any Android device without alterations or wrapping. And they can create standard management configurations that allow IT to apply policies per app. “Android for Work” seems to be Google’s first step towards making Android a Business friendly and Enterprise mobile OS and from what we can say, it looks quite good!